(20288.71.95.4, Chickasaw Council House Museum Collection, OHS). Located in northeastern Johnston County on the Johnston-Coal county line, Bromide is situated along State Highway 7D, twenty-one miles northeast of Tishomingo and 123 miles southeast of Oklahoma City. Named for nearby mineral springs, Bromide was founded by Judge William H. Jackson, a former superintendent of the Wapanucka Academy, a Chickasaw boarding school. He recognized the springs' potential to become a tourist attraction and organized the Jackson Land Company that established the townsite. The community was called Juanita (1905–06) and Zenobia (1906–07) before it became Bromide in 1907 and incorporated in July 1908. Bromide's first large business was a limestone quarry east of town. The enterprise belonged to Tulsa oilman Robert Galbreath, who used native stone to build a three-story hotel at Bromide in 1912. The hotel later housed the Bromide State Bank. A rock crusher operated northwest of the community. Stone became a principal export when a spur of the Missouri, Oklahoma and Gulf Railway (MO&G) reached Bromide in 1911. The MO&G (acquired by the Kansas, Oklahoma and Gulf Railway, KO&G) had been built three miles east of town in 1910. The MO&G ran weekly excursion trains to Bromide, promoted as "the best health resort in the southwestern states." Four hotels, including the Galbreath, a bathhouse, and a swimming pool served visitors to the town's sulphur and bromide springs. Agriculture, especially cotton, was also important to the economy. Other businesses included a cotton gin, a gristmill, a lumber mill, a flour mill, and the Bromide Herald newspaper. Bromide's popularity as a travel destination declined during the 1920s. By the beginning of the Great Depression the excursion trains had stopped running and the bank and hotels had closed. The KO&G line was abandoned in 1950 and only a grocery store operated there circa 1975. The population of Bromide peaked at 523 in 1920. That figure dropped from 352 in 1930 to 258 in 1950. After climbing to 264 in 1960, the number of residents fell to 180 in 1980. Bromide had 163 citizens in 2000 and 165 in 2010. During the early twenty-first century the community had a Baptist church, a construction business, and a post office. The nearby Wapanucka Academy site (NR 72001065) is listed in the National Register of Historic Places. 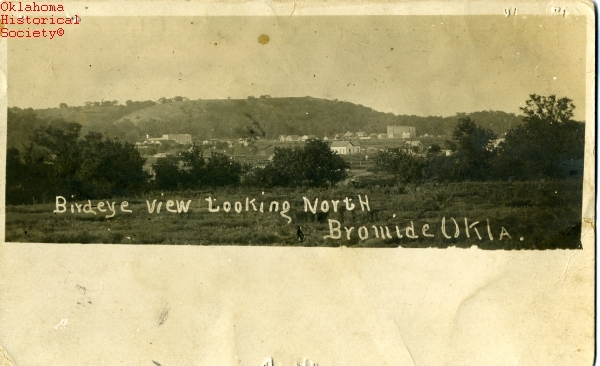 "Bromide," Vertical File, Research Division, Oklahoma Historical Society, Oklahoma City. Cathey Heddlesten, "Bromide," in Small Towns, Ghost Memories of Oklahoma: A Photographic Narrative of Hamlets and Villages Throughout Oklahoma's Seventy-seven Counties, comp. Shelley Berry et al. (Virginia Beach, Va.: Donning Co., 2004). Carl Reubin, ed., Johnston County History, 1855–1979 (Tishomingo, Okla.: Johnston County Historical Society, 1979). Jon D. May, "Bromide," The Encyclopedia of Oklahoma History and Culture, https://www.okhistory.org/publications/enc/entry.php?entry=BR021.